Our tools help you improve the selection of the most appropriate outcome measurement instruments in research and in clinical practice. Improve the selection of outcome measures when developing a COS with our systematic and consensus-based guidance. A joint initiative between COSMIN and Core Outcome Measures in Effectiveness Trials (COMET) aimed to develop a guideline on how to select outcome measurement instruments for outcomes included in a COS.
What is a Core Outcome Set (COS)? A COS is a consensus-based agreed minimum set of outcomes that should be measured and reported in all clinical trials of a specific disease or trial population; it is a recommendation of what should be measured and reported in all clinical trials. An outcome refers to what is being measured. It is also referred to as a construct or domain. In the context of a clinical trial it refers to what is being measured on trial participants to examine the effect of exposure to a health intervention. Once the COS is defined, it is then important to achieve consensus on how these outcomes should be measured, i.e. which outcome measurement instruments should be selected. An outcome measurement instrument refers to how the outcome is being measured. It is a tool to measure a quality or quantity of the outcome. The tool can be a single question, a questionnaire, a score obtained through physical examination, a laboratory measurement, a score obtained through observation of an image, etcetera. Medline (e.g., through the PubMed or OVID interface) is considered the minimum database to consult in finding all existing outcome measurement instruments. An additional search in EMBASE is highly recommended. 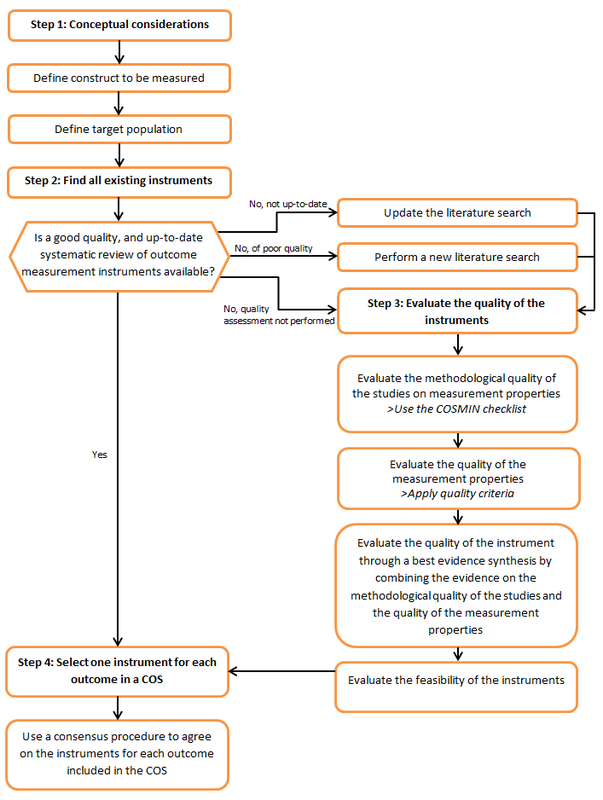 The process for the selection of outcome measurement instruments for core outcome sets is being displayed in a figure. COSMIN (COnsensus-based Standards for the selection of health Measurement INstruments) is an initiative of an international multidisciplinary team of researchers.